Rail companies invest a lot of money in eye-catching liveries to promote an image of efficiency, speed and comfort – so it is vital that this message is not obscured by dirt and grime. Smith Bros. & Webb helps train operating companies to keep their rolling stock as clean as economically possible with the Britannia train washing system that can accommodate any type of rolling stock. 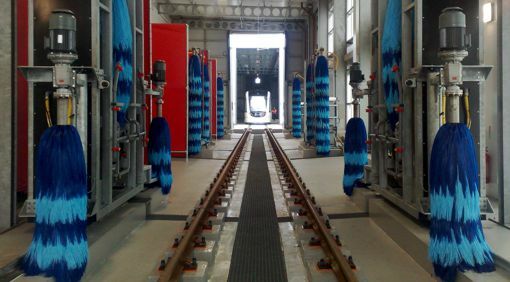 Capable of washing up to 200 carriages an hour, the fully automatic equipment will efficiently wash from a single car to a multiple of cars in any order of presentation for different gauge rolling stock. Robustly constructed, it gives an unsurpassed quality of wash, with brushes made of Polyethylene ‘X’ material which does not retain dirt and therefore does not replace the dirt it has just removed. 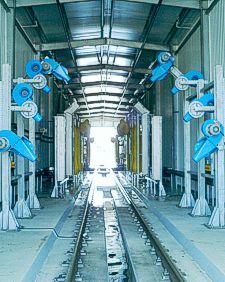 The Britannia fully automatic train washing plant has evolved to become an essential investment for railway rolling stock operators throughout the world. Easy to install, its modular design makes it easy for additional items, such as front, rear and roof wash, skirt and valance wash, water recycling and effluent treatment, to be fitted at a later date.